How important is your geographical location and physical environment when it comes to success in business? I’d say massively so after my past two days meeting some of the movers and shakers in the London Tech scene (14-15 April 2011)! Although based in the North East of England (Gateshead), I’ve been following with much interest the media buzz surrounding TechHub and the area dubbed ‘Silicon Roundabout’ in and around the Old Street part of the city. What is it that makes this place so special and does it really deserve all the hype? The first thing that struck me when arriving at Old Street tube station is that it’s actually a little bit of a dump – old and shabby! However, the roundabout itself is surrounded by shiny new high rise office blocks with the ubiquitous EAT! and Pret A Manger outlets which surprised me and isn’t really what I expected to find. Move just a few hundred yards from the roundabout though and I’d describe the area as ‘edgy’ with more rundown buildings containing a vibrant mix of takeaways, restaurants, bars and clubs, plus plenty of trendy young things walking about. 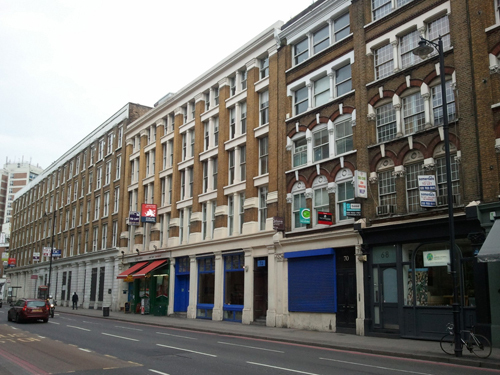 There’s also A LOT of empty office space with ‘To Let’ signs pretty much along the whole length of Old Street. This is exactly the type of environment in which creative, media and tech types tend to flock to as it offers them a vibrant social scene in which to network (over a beer, glass of wine or coffee) plus the great transport links (frequent buses and just two Tube stops from King’s Cross and St Pancras train stations) which make it within easy reach of the rest of the UK and mainland Europe! My first destination when I arrived was the apt-named Paul Street, just off Old Street, to meet and interview Rich Martell, the 21yr old Founder and CEO of Floxx – the flirting social network (video coming soon). I first met Rich after hearing him speak at the NACUE National Student Entrepreneurs Conference (NSEC) in Manchester and after several email, Twitter and phone conversations had arranged to visit his office to find out more. I predict big things for Rich who having previously launched the site as the phenomenally successful (and notorious) FitFinder whilst still at University has recently relaunched it as the more internationally-friendly Floxx.com with VC investment of £100,000 from original Dragon Doug Richard (@dougrichard) and Silicon Valley investor Kevin Wall. Charismatic and charming, Rich is typical of the new breed of successful entrepreneurs I have been lucky to meet who are open to ideas and genuinely interested in the people around them. During our conversation about Floxx and Shell LiveWIRE, Rich mentioned a student intern that had recently joined the Floxx team called Tom from Durham University who he thought might be an ideal candidate for our monthly £1,000 Shell LiveWIRE Grand Ideas Awards. He then brought Tom in so I could explain more about our programme and encourage him to apply, which I hope he does for his interesting new business ‘The Doorman’ (watch this space). For the rest of our meeting we shared lots of ideas and information about the London Tech Start-Up scene and the importance of location to him and his business. Rich talked about the vibrancy of the area and the attraction of being in such close proximity to other tech start-ups in and around ‘Silicon Roundabout’ for networking and sharing of ideas. 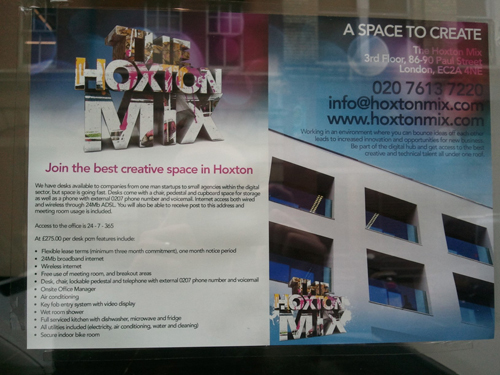 A good example of this is the fact that the Floxx team are currently housed in a cool shared office called ‘The Hoxton Mix’, sitting alongside other tech businesses like SoundCloud and specialist PR agency 33Seconds who they have started to work with. It’s this type of close proximity and clustering of similar and related businesses that makes it easier for co-promotion and cross-pollination of ideas which is mutually beneficial to each of the businesses. It also became apparent that although part of a vast city, the London Tech scene was actually quite small with Rich seemingly knowing many of the key players whose names kept popping up during the two days I was in London. After leaving Floxx, I headed on down to TechHub which is very much in the heart of ‘Silicon Roundabout’ on City Road and has been generating a lot of PR buzz in recent months. Overlooking the high street with big glass frontage, TechHub has a relaxed and informal vibe about it upon arrival – with a reception desk manned by the wonderfully helpful Tina, open plan hot desk area and comfy sofas by the door and window, two small meeting rooms and a kitchenette on opposite sides of the room, and a more private room at the back where the ‘resident’ members are working side by side in what reminds me of a university or library computer room! 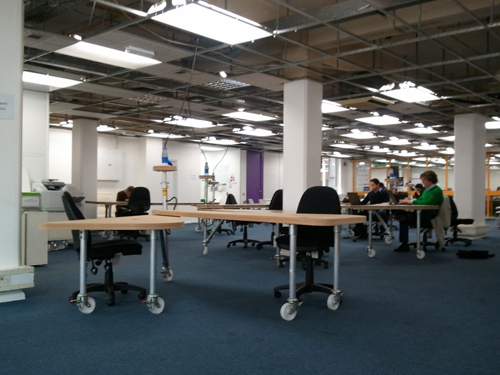 TechHub is open to most users between Monday to Friday, 9am-6pm (although the residents have 24hr access to the building with many of them working throughout the night). I was slightly surprised to hear that there is a vetting system for approving new members, but in a city like London I can see why this is necessary as TechHub is much more than just a place to work with regular social events, demo evenings and frequent visits from the media and investment world so the founders are trying hard to maintain the quality of businesses involved. 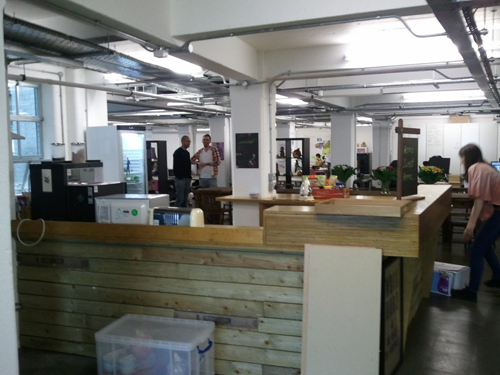 Admittedly the rooms and facilities themselves at TechHub aren’t the prettiest I’ve seen but this is more than made up for by the location, connections and networking opportunities available for anyone choosing to do work there. This was confirmed by the start-ups I interviewed – Squadify, Sharkius Games, Developer Fusion, TechEye and Caped Koala / Pora Ora (videos coming soon) who all talked excitedly about the benefits of being housed in such a vibrant place compared to working from home or in a non-descript office in some other part of town. The people behind TechHub – Elizabeth Varley (@evarley) and Mike Butcher (TechCrunch) are also doing a fantastic job of shining a light on the businesses coming out of the building (and the London scene in general) which is benefiting each and every member of the TechHub community. 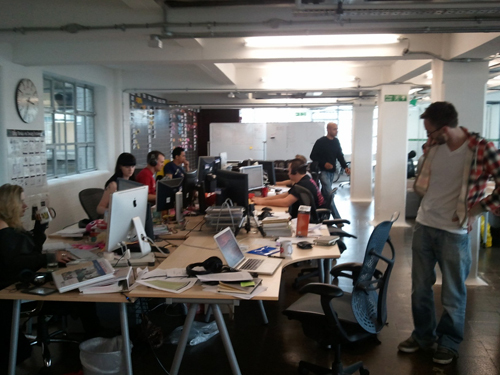 Having spent a couple of hours in the place and met not only the people behind it but some of the businesses that are using the facility, I’m pleased to say that TechHub really does live up to the hype and highly recommend any tech start-ups pay a visit the next time they’re in London even if just to soak up the positive vibes and anything-is-possible attitude of the place! 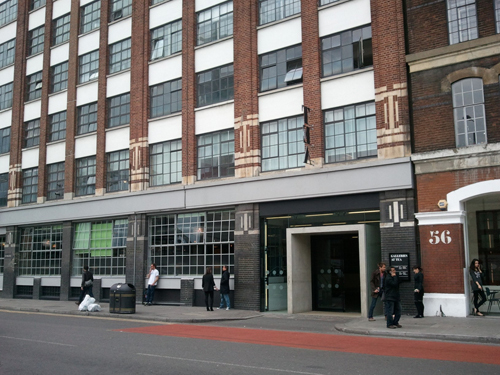 My final destination for the day was the wonderful Tea Building (former Lipton Tea Building) on Shoreditch High Street, just a short walk from TechHub via Great Eastern Street. As I walked towards the Tea Building, the shops, bars, cafes and restaurant became smarter and there was definitely a cool vibe about the place and the people walking around. My reason for visiting the Tea Building was to meet and interview Michael Acton Smith (@acton), founder of Firebox.com and now Mind Candy – home of the phenomenally successful Moshi Monsters (37m registered users worldwide)! Being a big fan of Firebox and having seen and heard lots of great things about Michael and Mind Candy, I was excited to finally get to meet the man behind the brand. Michael didn’t disappoint and is everything I hoped he would be – intelligent, smart, charming, engaging and fun with a cool, rock & roll vibe about him (wild hair and snakeskin boots and all)! Not only that, but the Mind Candy office he has created is truly something else. You couldn’t fail to be inspired to work in such an environment as this with bright Moshi Monsters artwork on the walls, interesting and exciting breakout areas and meeting rooms, quirky art and all the paraphernalia that you would expect from one of the UK’s most exciting and creative tech and media companies. There’s clearly a lot of thought (and money) gone in to creating such an environment and I wouldn’t be surprised if it won some kind of interior design / best office award in the future! Waving Hello To The People Below! During our fantastic interview (see video below) Michael confirmed that the working environment was crucial to getting the best out of his team and making them feel valued, expressing dismay at how many businesses continue to work in boring, drab and soulless offices. If only more companies would take heed and put more effort into their place of work then perhaps we would have more success stories like Mind Candy throughout the UK? As I leave the city with a much better understanding of the London Tech scene, I feel very proud that we have such great businesses and entrepreneurs in the UK right now. Geographical location and infrastructure are clearly important with London at the forefront of the Tech world. However, I feel that the physical environment, sense of community and access to networks of like-minded people is equally if not more important. There’s really no reason why there can’t be satellite hubs and versions of ‘Silicon Roundabout’ up and down the country with a little bit of thought and effort from the local businesses and powers that be. There are obviously many different ingredients at play here but it can be done as the ‘Silicon Alley’ area of Pink Lane in my home town of Newcastle has shown in the past (albeit on a much smaller scale). All it takes is a bit of effort, determination, imagination and a few key ‘connectors’ to bring people together around a common purpose and goal. You can see the raw ingredients and potential in towns and cities everywhere. If you’d like to share your thoughts on this topic please leave your comments below, email me at plandigital@live.co.uk or send me a Tweet to @plandigitaluk. You can’t run a government solely on a business basis… Government should be human. It should have a heart.